As I was placing the array of toppings for my Thai Noodle Bowl on my counter, I had a flashback. I zoomed back in time to when I was a kid on Taco Night. We would load the middle of the table with all our favorite taco toppings as the scent of ground beef and tortillas sizzling in frying pans filled the air. Kuay Tiaw Haeng, aka Thai Noodle Bowls, and tacos definitely don’t taste the same. But both of them have lots of fun toppings, and like with tacos, you can have fun with your family by making your Thai Noodle Bowl taste as spicy, sweet, or savory as your heart desires. In Thailand when you order noodle soup, you can either get it dry, without broth, or with broth. Kuay Tiaw Haeng in English means Dry Noodles because everything you put in the noodle bowl is what you would normally have in a Thai soup broth. One of my favorite ways to eat noodles in Thailand is “dry”, without the soup broth. Dom was so excited when he saw the Thai noodle bowl I had concocted for him, the way he likes it best with lots of fried garlic and bean sprouts, and not too much Thai chili powder. He devoured it and soon was making another bowl. And my 2-year-old ate hers so fast I wondered if she had dumped it all out somewhere, which has happened before, but she hadn’t! 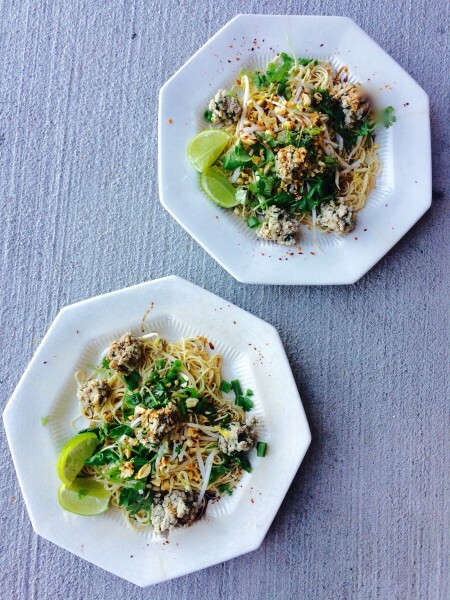 Like I have fond memories of my family crunching on tacos together around the table, it made me hope one day all my kids will have flashbacks to Thai Noodle Bowl night, and all the smells, and tastes and fun they had with us as a family. Make some sweet food family memories tonight by trying Thai Noodle Bowls, and let us know what you think! Try Thai Noodle Bowls for a fresh, easy week night dinner! Make the noodles according to package instructions. 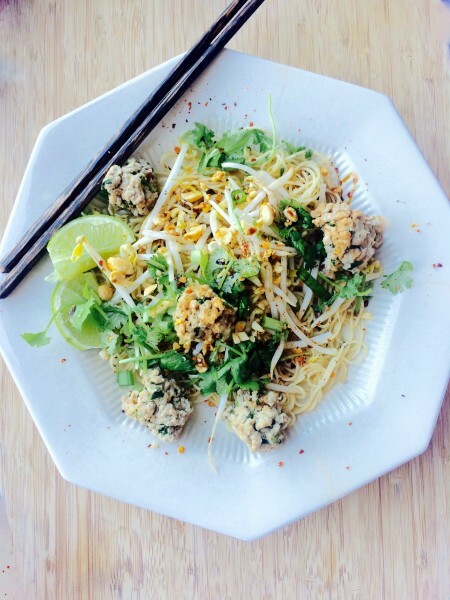 Make super quick meatballs by combining the ground turkey, cilantro stems, white pepper, garlic and oyster sauce. Roll into balls, and while the water for the noodles is boiling, plop the meatballs into the boiling water. It only takes a few minutes to cook them, and they should rise to the surface when cooked. Drain the noodles and meatballs into a colander. Add noodles and meatballs to each bowl along with all toppings to taste and preference. 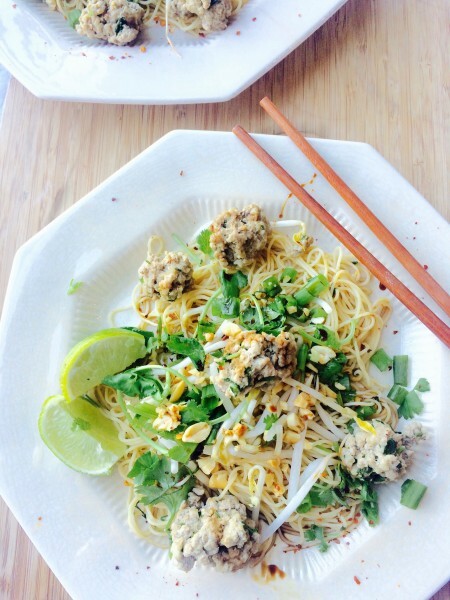 In Thailand they typically have pork balls, and pork tenderloin in their Kuay Tiaw Haeng. The pork tenderloin is cut into bite-size pieces and cooked in the same boiling water as the noodles. So feel free to substitute the meatballs for that or the pork tenderloin for whatever meat you have in your fridge that you want to use up like rotisserie chicken, etc.